TENGA's a new modern choice of personal relieve aids safety tools for modern men who want to release stress, prevent and avoid promiscuity of unnecessarily S.T.D. risk. And It's an Onacup with Innovation & creative designed to bring you never-before-experienced sensual sensations. Thanks to great success of Flip Hole worldwide Tenga proudly announce two brand new styles of the FLIP HOLE Series - Flip Hole Red and Flip Hole Silver. Densely packed protrusions brush along, a stream of smoothly formed ribs, ribs aligned in a fan-shape sector amplify the stimulation and will bring you a never-felt-before sensation. 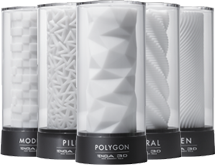 The TENGA 3D series bring a male pleasure through elegantly designed items comparable to fine sculptured objects. Reversal of convention - a solution to the lewd internal detailing of devices of the past, which upon washing, drying and storing are always visible - the TENGA 3D transforms its aesthetically pleasing external design priced with Red Dot Design Award 2012. Looking for your TENGA retail store here!